Here’s the first movement of a new piano piece I’m working on, Cherry Blossom Bosoms. 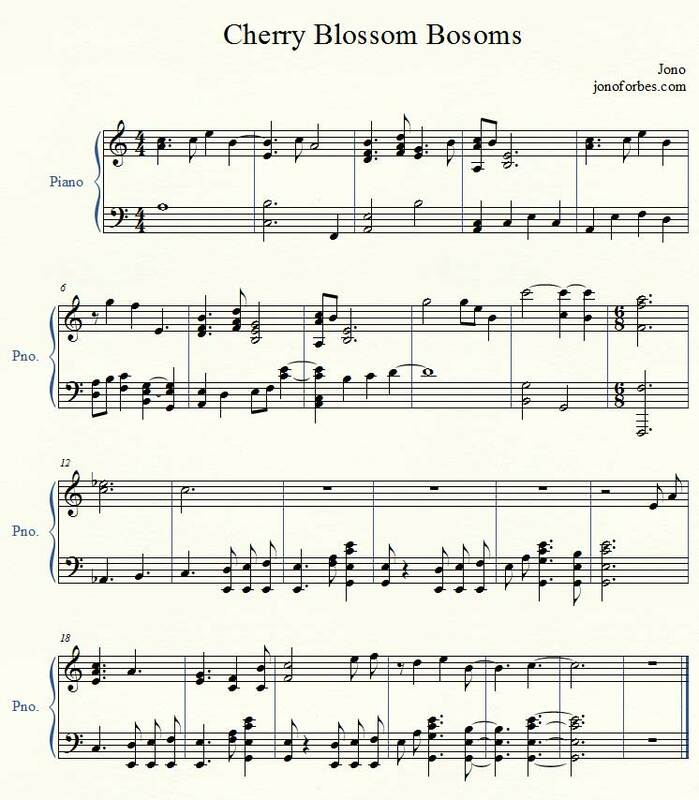 This piece represents a very different approach to music-making for me: I wrote it as sheet music (Finale) first, and then learned to play it from that score. I feel that this method made Cherry Blossom Bosoms come out of my musical box at least a bit — when I sit down at a piano, I generally play the same kind of pianoy stuff, because that’s what my fingers know how to play (I don’t have formal training, and piano isn’t my primary instrument; I mainly learned by transcribing some of my guitar pieces, reading a little bit of sheet music, and jamming around from there). It also made me improve, at least a bit, at piano: I previously hadn’t written any pieces with very different rhythms for each hand, and it took a lot of practice to be able to play the piece comfortably. The method also came as a matter of necessity: I wrote the piece in January 2013, when living in Japan with my girlfriend, where I had no musical instruments, just my laptop. That was very much an intentional situation, as I was curious to try “pure composition” (and not ship anything to Japan), and I’m very happy with the result. 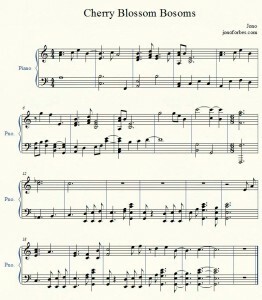 I have just about finished the second movement (/revision) as well, that’ll be here real soon. Just might have to take you up on that 😛 Do you have any recordings made of the piece? Please do! The SoundCloud widget is a real recording (from my keyboard), and also feel free to use the MIDI file. Also I am presently back at my piano, trying, again, to get a solid recording of the second part. Very soon!